Part I. Addressing Societal Institutions and Values. Mission More Probable: Media Literacy, Activism, and Advocacy as Primary Prevention. Eating Disorders: Transcultural Perspectives Inform Prevention. The Role of Parents in the Emergence, Maintenance, and Prevention of Eating Problems and Disorders. The Bolder Model of Prevention: Science, Practice, and Activism. Part II. Prevention Programs for Elementary and Middle Schools. Elementary School Curricula for the Primary Prevention of Eating Problems. Resisting Weightism: Media Literacy for Elementary School Children. Discussion Groups for Girls: Decoding the Language of Fat. Peer Relations, Body Image and Disordered Eating Adolescent Girls: Implications for Prevention. The Reduction of Preoccupation with Body Weight and Shape in Schools: A Feminist Approach. Part III. Prevention Programs for High Schools and Colleges. The Efficacy of Eating Disorder School-Based Prevention Programs: Building Physical Self-Esteem and Personal Competencies. The Looking Good, Feeling Good Program: A Multi-Ethnic Intervention for Healthy Body Image, Nutrition, and Physical Activity. 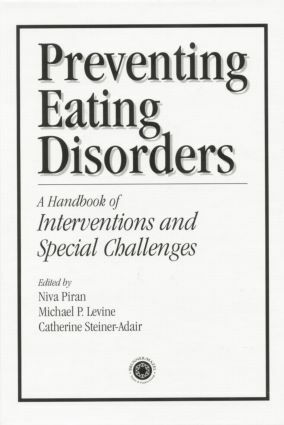 Sexual Harassment and the Prevention of Eating Disorders: Educating Young Women. An Integrated Prevention Intervention Program. The Panhellenic Task Force on Eating Disorders: A Program of Primary and Secondary Prevention for Sororities. Part IV. Special Challenges: High Risk Populations and Secondary Prevention. Small Victories: Prevention of Eating Disorders among Elite Athletes. On the Move from Tertiary to Secondary and Primary Prevention: Working with an Elite Dance School. Preventing Eating Disorders in Young Women with Diabetes. Working with Physicians Toward the Goal of Primary and Secondary Prevention. Prevention of Medical Complications in Children and Adolescents with Eating Disorders. Reflections, Conclusions, and Future Directions.